Atlas Quest: Introducing... eclipse glasses and my newest book! Introducing... eclipse glasses and my newest book! There are now two new items in the AQ Marketplace! First up: eclipse glasses. For those of you keeping track of these things, the first total solar eclipse to hit the contiguous United States is scheduled to sweep through the country on August 21st. And when I say sweep through the country, I mean it--from Oregon to South Carolina! From sea to shining sea! If you've never experienced a total solar eclipse, you've never witnessed the most spectacular natural event you'll likely ever see. I've had the privilege of seeing them twice and traveled to the Black Sea (1999) and Zimbabwe (2001) in order to see them. This time, it'll be in our own proverbial backyards! The path of totality is only about 70 miles wide so most of you might have to travel a bit to see it, but it's well worth the effort. Start planning today if you haven't already! If for some reason you can't get to the path of totality, the entire rest of the contiguous United States will see a substantial partial eclipse that covers over 50% of the sun's surface. But seriously, make the effort to get to the eclipse path. I can assure you, a 99% covered sun and 100% covered sun is as different as night and day. Don't think you get 99% of the magic with a 99% covered sun--it doesn't work like that! However, as anyone with two brains cells can likely tell you, staring directly at the sun is very dangerous! You must either view the sun indirectly through something like a pinhole viewer, or through filters that take out about 99.999% of the visible light. 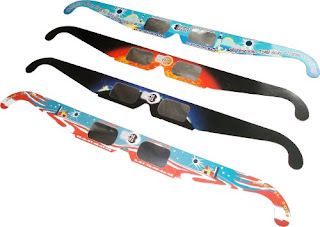 So I ordered a whole bunch of eclipse glasses so you can watch the eclipse safely. They come in sets of four, with each of the four being a different design. Share the extras with friends or family, or sell them at inflated prices on the day of the event to people who didn't order ahead of time. =) Supplies are limited--when I run out, I do not plan to order more. Although if I sell out really quickly--like in less than a week--I'll order more. But in any case, I wouldn't wait until the last minute to order. Supplies may be hard to come by as the event looms ever closer. Also added to the AQ Marketplace.... a new book: Opowieść o dwóch szlakach. No, that's not a cat walking over my keyboard. That's the name of the book. 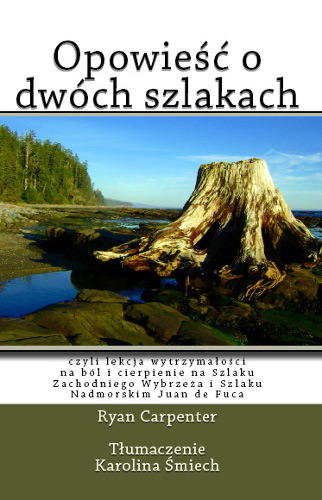 It's a Polish translation of A Tale of Two Trails about my adventures on the West Coast Trail and Juan de Fuca Trail in Canada. Yes, that's right, the book sold so well, it's been translated into Polish! Just kidding... it hasn't really sold that well. For anyone who reads my Another Long Walk blog, you're familiar with my Polish buddy, Karolina. Years ago she had told me that she was thinking about taking a course to become an English-to-Polish translator, and I somewhat jokingly said if she wanted to practice, she could translate my book into Polish. She actually liked the idea and started work translating it. It took a few years before she emailed the final draft to me, and I packaged it up into a book form. So there you have it--my book translated into Polish. In related news, I also made a few tweaks to the AQ Marketplace changing the prices so shipping is "free" in the United States. I put "free" in quotes because obviously, it's not free--it's just part of the price of the product now. I wanted the actual price for items displayed and not require people to add or subtract items to their shopping cart to figure out what shipping would be. I wanted to make the actual prices of ordering something more transparent. It also now displays the 10% discount for premium members. If you live in the United States, the price you see is the price you pay! (Except if you live in Washington state, then I have to collect sales tax. Sorry! The sales tax is calculated based on your address, so it's not calculated until your zip code is entered.) Non-US shipping prices vary from $2 to $10 depending on what you order and where it's going.